Congratulations ! The original artwork is available for purchase for $3435.30 shipping included. You will be able to review this purchase in the subsequent screens. If you have a question, please email support@pastelspace.com. Purchase 1068 x 800 pixel digital file by using the Buy Now buttons below. You will receive an email with the download link. You can use the link 5 times to download the digital file. This painting is a play on the famous painting "Last Supper". Depictions of the Last Supper in Christian art have been undertaken by artistic masters for centuries, Leonardo da Vinci's late 1490s mural painting in Milan, Italy, being the best-known example. The Last Supper is the final meal that, in the Gospel accounts, Jesus shared with his Apostles in Jerusalem before his crucifixion. The Last Supper is commemorated by Christians especially on Maundy Thursday. 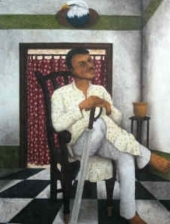 The artist Anjan Patra A B.V.A ( Hons), Indian Painting from Govt. Art college, has participated in Shows at the Birla Academy, A.I.F.A.C , Academy Annual ,Tathya Kendra, State Acade, National Exhibition, Camlin India. 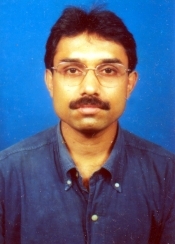 He was awarded The Certificate of Merit from the National Board in 2006. Although figurative in style, Anjan has chosen a less popular, tougher medium of Tempera, on canvas or board, in which he uses naturally ground vegetable pigments & combines them with a paste from the babool tree to use as a binder. This technique results in a superb finish, which is matt & refined, & the longevity even in humid conditions, phenomenal. Anjan has been trained in the school of Indian Painting ,& inspired by Indian miniature paintings, which is reflected in his use of flat colours & clever use of negative & positive space, vis a vis the Western school of painting, which relies more on bringing its subjects to life thorough light, shade & perspective.There is a tendency to give a rich network of intricate patterns symbolizing the labyrinth of the character's thought process & inner beauty or turmoil, as the case may be. 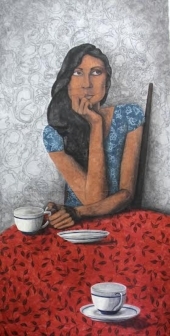 Anjan's subjects are a statement on society, reflected through facial expressions & body language of his characters. Sometimes, it is a comment on poverty, other times it's old age & at others,a satire on the wealthy. It is that particular moment which counts, in a language all his own..
New artwork uploaded. This painting is a play on the famous painting "Last Supper". Depictions of the Last Supper in Christian art have been undertaken by artistic masters for centuries, Leonardo da Vinci's late 1490s mural painting in Milan, Italy, being the best-known example. The Last Supper is the final meal that, in the Gospel accounts, Jesus shared with his Apostles in Jerusalem before his crucifixion. The Last Supper is commemorated by Christians especially on Maundy Thursday. 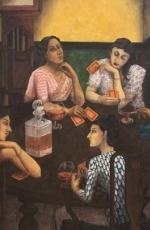 The artist Anjan Patra A B.V.A ( Hons), Indian Painting from Govt. Art college, has participated in Shows at the Birla Academy, A.I.F.A.C , Academy Annual ,Tathya Kendra, State Acade, National Exhibition, Camlin India. He was awarded The Certificate of Merit from the National Board in 2006. 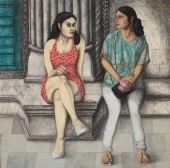 Although figurative in style, Anjan has chosen a less popular, tougher medium of Tempera, on canvas or board, in which he uses naturally ground vegetable pigments & combines them with a paste from the babool tree to use as a binder. This technique results in a superb finish, which is matt & refined, & the longevity even in humid conditions, phenomenal. Anjan has been trained in the school of Indian Painting ,& inspired by Indian miniature paintings, which is reflected in his use of flat colours & clever use of negative & positive space, vis a vis the Western school of painting, which relies more on bringing its subjects to life thorough light, shade & perspective.There is a tendency to give a rich network of intricate patterns symbolizing the labyrinth of the character's thought process & inner beauty or turmoil, as the case may be. Anjan's subjects are a statement on society, reflected through facial expressions & body language of his characters. Sometimes, it is a comment on poverty, other times it's old age & at others,a satire on the wealthy. It is that particular moment which counts, in a language all his own.